The Democratic Karen Buddhist Army released a statement defending their Commander-in-Chief Brigadier, General Saw Ler Pwe, who was listed on a most-wanted list of drug traffickers this week by the Thai government’s Narcotics Control Board. Karen News is led to understand the DKBA leader, Brigadier General Saw Ler Pwe (also known as Na Khan Mwe), is furious at the Thai government listing. The DKBA released a statement warning the Thai government that they would be held responsible for the damage their accusations have done to the reputation of their leader and the DKBA if he is not guilty of the alleged crimes. The DKBA statement said they have only gone public to defend their leader in response to Thailand’s Deputy Prime Minister Chalerm Yubumrung recent Thai television interviewing naming and accusing the DKBA’s Brigadier General Saw Ler Pwe as one of the 25 most wanted drug dealers on the Thai government’s list. A DKBA’s spoke person, Captain Saw Ko Myo, refuting the allegation cryptically told Karen News. Captain Saw Ko Myo added that the DKBA made a statement in response to the Thai government’s accusation because the allegations hurt not only the personal image of their leader, but also smeared the DKBA and Burma. Captain Saw Ko Myo told Karen News that General Saw Ler Pwe was furious with the Thai government’s allegations. The DKBA statement invited Thailand’s Deputy Prime Minister Chalerm Yubumrung to carry out investigations related to drug issues at any of the DKBA bases and if any are guilty, they are willing to go to any court or stand trial. The DKBA statement said that if there is concrete evidence of drug involvement by the DKBA it should be presented, but smearing someone’s name in the media and without proof is also against the law. The DKBA statement sent an open invitation for the Thai government’s Deputy Prime Minister Chalerm Yubumrung to come and investigate the drug claims that is valid to until April 30. The DKBA statement said that if the Thai government does not solve the problem to their satisfaction, the DKBA will sue the Thai government according to international law. The DKBA said that they have signed an agreement with the Burma government on December 11, 2011 agreeing to coordinate and fight against drug trafficking. Karen News were unable to secure an interview with General Saw Ler Pwe about the Thai government’s bounty on him but his spokespeople said that for legal reasons, he would not be directly speaking to the media. Thai government announced on April 20, that the Office of the Narcotics Control Board (ONCB) was offering 12 million baht (US $388,000) reward for the capture of 25 of the country’s most-wanted drug dealers. The list included three people from Burma – Naw Kham from the Golden Triangle region, Yi Say from the Burmese town of Tachilek area the DKBA’s General Saw Ler Per from southern Karen state. 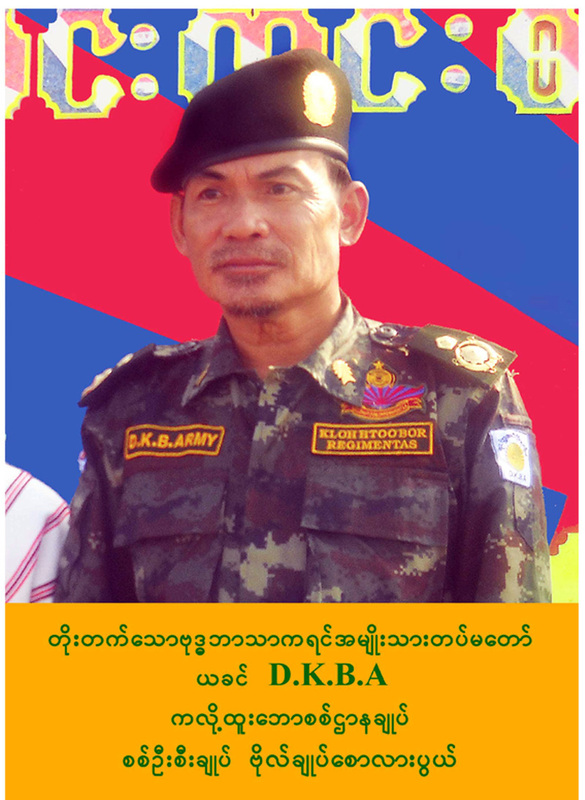 The DKBA broke away from the Karen National Union in 1994 and allied itself with the Burma military government until August 2010. After the DKBA was ordered by the military regime to transform into a Border Guard Force militia under the direct control of the Burma Army, a breakaway faction led by General Saw Ler Pwe fought against the Burma government for more than a year. On November 2011, the DKBA reached a ceasefire agreement with President Thein Sein’s government.